People may want to learn other languages because they want to learn about others and their cultures. Some for self gratification and some for recognition. I speak 3 languages - English, Malay, Kadazan/Dusun - and a couple of other dialects, if you can call those languages. There may be more that are not documented, and depending on how how high we set the bar of fluency, Ziad Youseff Fazah is the man. Ziad Fazah, born in Liberia, brought up in Beirut and now living in Brazil, claims to be the world's greatest living polyglot (multilingual) with a total of 59 languages (the wikipedia's figure of 58 is a bit outdated). However, there are others (people no longer living) with more languages and dialects such as Cardinal Giuseppe Caspar Mezzofanti. Cardinal Mezzofanti, born in 1774, spoke 38 languages and 40 dialects. Meanwhile, the 10th-century Muslim polymath Al-Farabi was said to know 70 languages. The German Hans Conon von der Gabelentz, born in 1807, was cited to have researched and published grammars of 80 languages. The record, though, probably belongs to Sir John Bowring, Governor of Hong Kong from 1854 to 1859, who was said to know 200 languages, and capable of speaking 100. Bowring was an English political economist, traveller, miscellaneous writer, polyglot, and the 4th Governor of Hong Kong. 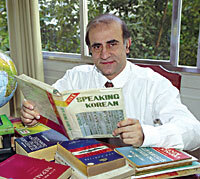 Now, I want to hear him (Ziad Fazah) speaking in Malay and Indonesian languages. Wow , 59?! That's impressive. I'm wondering if he speaks gibberish and tongue language as well. Na, I'm just kidding. Lol.